It’s funny, when you start out, you never really know where your career will lead and that’s certainly very true working in photography. I started with no formal training as such (I studied print making at university) but picked things up along the way. The big break for me was landing a job with Getty Images, which really helped me develop as a photographer. My role there, working alongside the art directors, was shooting imagery for the creative library and proved really varied. One week I’d be shooting portraits, the next it might be a sports shoot or even an animal shoot in a studio. This was good in one sense as I developed lots of different skills aside from the photography and I became pretty adaptable and resourceful, turning my hand to all sorts of shoots. Invariably working in the studio would require set building, which could be quite involved and amount to an exercise in problem solving, bringing together skills such as carpenter, builder and photographer (we even built a 15ft water tank to shoot swans in – getting rid of the water after was a challenge). This knowledge has stood me in good stead ever since and was very useful for a couple of commissions for Shimano, the bike component manufacturer which came through Antidote, a creative London advertising agency that has helped many cycling related brands including Team Sky, Rapha and Evans Cycles. Shimano had, up to this point, been a little sterile in their advertising execution so Antidote was tasked with making the brand more emotive. I had previously worked on a couple of other Shimano campaigns including the launch of road disc brakes which featured a group of professional cyclists (see image) looking through a shop window at night wishing they could own a set of the disc brakes. This involved a set build and had to be shot in a hotel in Belgium before the Liège-Bastogne-Liège race (it featured Simon Gerrans & Tom Dumoulin). But a slightly more challenging proposition came in the follow up shoot for Shimano’s launch of their 11spd Ultegra Di2 groupset. 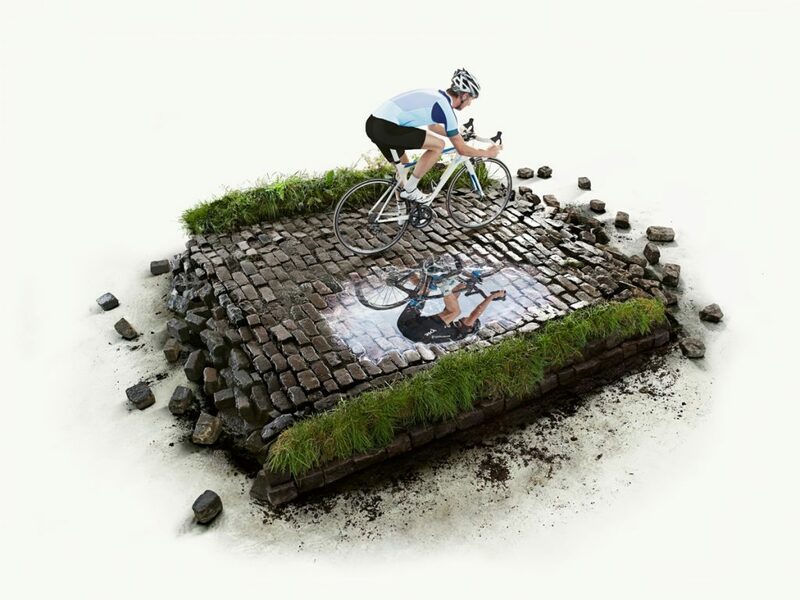 Working with the same team at Antidote, the campaign featured an amateur cyclist riding a section of pave or cobbled road (typically used in races such as Paris-Roubaix and the Tour of Flanders) with his reflection in a puddle replaced with that of a professional Team Sky rider. On paper, shoots like this can look quite simple but once you start to work out the logistics things can be more complicated than first appeared. 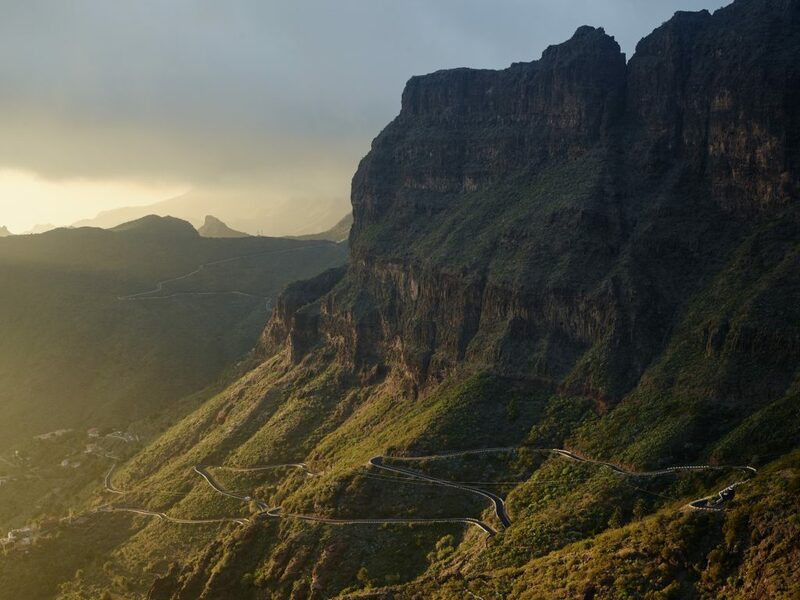 The initial thought was to shoot on location in Belgium or France but that involves location scouting to find a suitable road with a puddle large enough to reflect the rider. There’s the added complication of road closures, the expense of bringing out a team and then the impossibility of controlling the weather! Creatively we also liked the idea of isolating the set against a white background so it was decided to build a set in the studio where we could control everything. 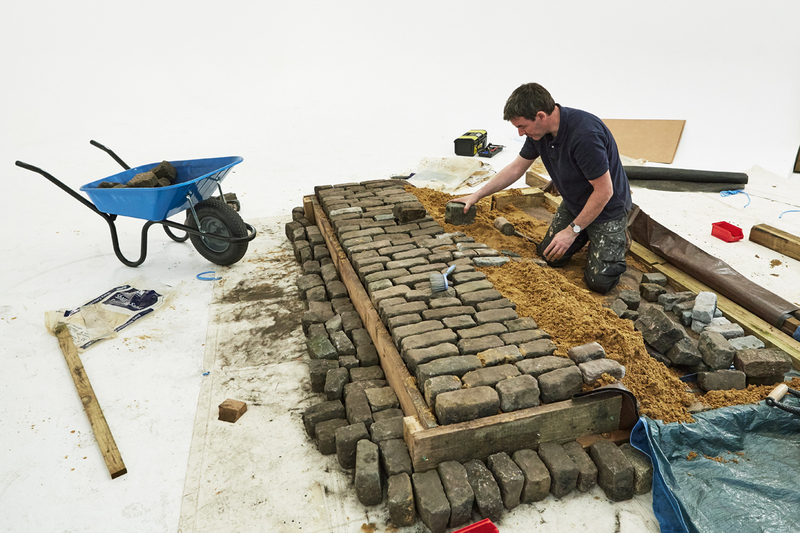 Authentic cobbles were sourced from Birmingham (eight tons in all) and delivered to the studio. A team was assembled to help with the set build which comprised of a wooden frame to hold the setts (so they would hold firm when a rider cycled over them) but which was deep enough to create a crest in the middle of the road and a puddle off to the side. Some 50 bags of sand were used for padding, and pond liners hidden under the cobbles were used to contain the water in the puddle. A grass verge added the finishing touches but had to be sourced the day of the shoot to stop it wilting. The shoot wasn’t without its complications – the lorry delivering the cobbles couldn’t get on site, so two tons were wheel barrowed to the studio and the rest redelivered the next day on a smaller truck. Some of the granite setts needed to be cut (which is no mean feet) requiring an industrial disc cutter. The puddle actually leaked and part of the set needed to be rebuilt. We knew getting a good reflection in the puddle would be problematic so large mirrors were used and the reflection retouched into the puddle after. We still needed the puddle to create a ripple and an edge between the water and the cobbles. 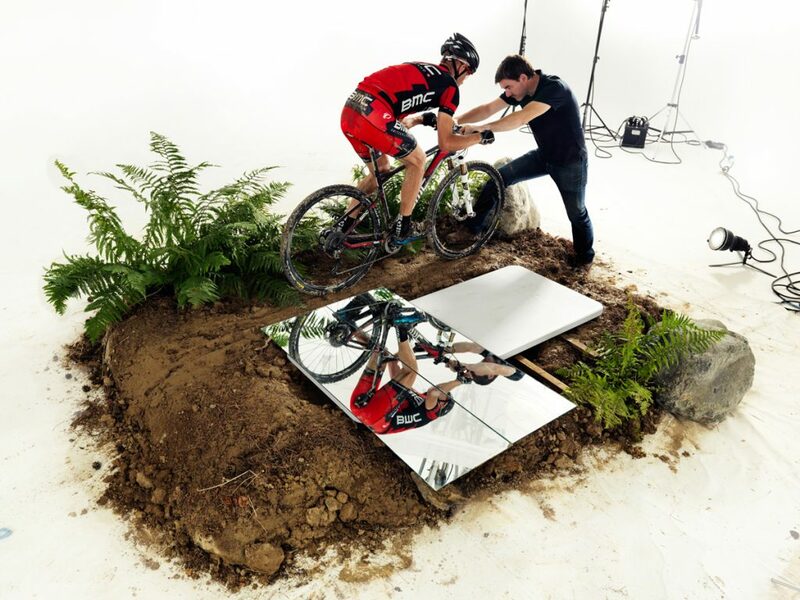 It was a lot of hard graft but we got there in the end and it resulted in a follow up shoot for their mountain bike components, which featured a muddy forest trail lined with ferns and huge granite boulders. As a footnote – it took two days to build and two days to break each set build, plus the clean up of the studio. I had eight tons of cobble setts to dispose of too, along with all the sand and glacial boulders, not an easy task!